Trying to get beyond the rhetoric on border security or immigration at the state or federal level is often a fool’s errand. Here are eight secrets in those often shadowy arenas. 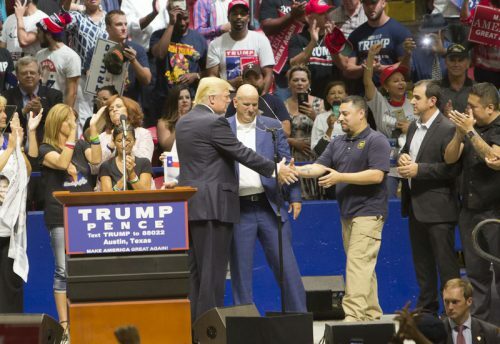 Illegal immigration and border security were top issues in 2016, and recent pronouncements by Texas Gov. Greg Abbott, President-elect Donald Trump and others suggest they will remain red-hot into the New Year. But trying to get beyond the rhetoric at the state or federal level is often a fool’s errand. Want to find out what specific locations immigrant smugglers used most to transport their loads? Which gun dealers sold the most firearms that ended up in the hands of Mexican drug cartels? The deportation history of undocumented felons in your local jail? Or what, beyond vague written statements and tweets, the state’s tough-talking Texas governor wants to do about employers who give jobs to undocumented immigrants? Call it bipartisan secrecy. Although the 1974 U.S. Privacy Act was written to protect the privacy of citizens and lawful U.S. residents, the federal government — under both Republican and Democratic rule — has adopted regulations applying it to undocumented immigrants, too. That includes those with criminal records. What that means is that Immigration and Customs Enforcement provides detailed immigration histories of “criminal aliens” only when it chooses to — like after high-profile cases that spark local outrage. ICE refused, meanwhile, to give The Texas Tribune identifying information about any significant slice of the immigrant population it detains, deports or releases — extending privacy protections even to nine of the state’s 12 undocumented death row inmates. It used to be that journalists and activists could get ICE to provide a list of names of employers fined for hiring undocumented immigrants. The federal agency still occasionally issues press releases shaming companies at its discretion. But as the Houston Chronicle reported in 2010, ICE decided it is “no longer releasing information to the public on companies fined for hiring illegal immigrants.” At the time the agency cited a pending court case. ICE said the policy of not providing the list remains in effect. The Tribune is fighting to get the information under public information laws, most recently with an appeal of an initial denial from the agency. The Tribune has attempted to ascertain what the Texas governor — who tweets tough on border security and immigration — would do about rampant illegal hiring of undocumented workers in Texas. Recent statements suggest Abbott, while arguing that the state had to step in where the feds failed on border security, would leave the more politically sensitive task of private workplace enforcement up to Uncle Sam. But an official border security talking points memo obtained from Abbott’s office under open records laws notes that people “are mainly immigrating into the U.S. for jobs,” and advocates for a generous flow of foreign workers: “a 21st century guest worker program based on market/workforce demand (rather than relying on arbitrary limits on the number of guest worker visas issued).” Abbott’s office said those were Rick Perry-era documents, though that particular passage was contained in a document dated weeks after Abbott succeeded Perry. What, then, are Abbott’s own ideas? One clue may be hidden in a blacked-out memo, contained in a batch of records related to immigrants in the workplace. Only Abbott’s letterhead insignia escaped the magic redacting marker. Texas regulators can slap the wrists of employers who use one of the most common schemes to hire undocumented workers: “misclassifying” their employees as contractors. That allows them not only to evade responsibility for checking work papers but also to avoid paying taxes. But don’t ask regulators for the names of the small handful of employers penalized since the weak law went on the books in 2013. That — you guessed it — is a secret. When you’re booked for a crime, jails in Texas and beyond often don’t ask whether you’re a citizen or not, let alone whether you’re authorized to be in the country. Jailers are supposed to determine whether an inmate is “foreign born,” but since that designation can include people living here legally — everyone from agricultural guest workers to naturalized U.S. citizens — the data generally can’t be used to track crimes by those here illegally. The Tribune asked 26 Texas counties for information on immigration procedures and booking status of potentially deportable jailed inmates. Most refused, with the acquiescence of Attorney General Ken Paxton. Only one county, Travis, gave enough information to analyze the data. The Tribune, in a first, did manage to estimate the percentage (and various characteristics) of undocumented immigrants in the state prison system. The results may surprise you. Secrecy reigns from the moment the Border Patrol apprehends an undocumented immigrant until he or she gets through removal proceedings. Federal detention centers in places like Karnes and Dilley in South Texas are often located in remote areas, far away from attorneys and population centers where family members might reside. The Boston Globe describes it as “the nation’s most secretive detention system,” where inmates have no right to a lawyer and usually don’t get one, nor anything approaching the due process one might expect in a standard federal prison context. Frantic family members and even lawyers sometimes lose contact for weeks or months with loved ones or clients who disappear into the bowels of a vast private prison network. Once in immigration court — often conducted behind prison walls — immigrants and their representatives don’t have a right to get all the evidence the government uses to remove them, experts say, forcing their lawyers to file pubic information requests that often don’t produce the information ahead of a deportation. People like to throw around the word “porous” when it comes to Texas’ southern border. But don’t get too nosy about where the biggest pores are. There are nine Border Patrol “sectors” on the U.S.-Mexico border, four of them wholly contained in Texas and one (the El Paso sector) that includes New Mexico. But these are huge geographic areas. The Tribune, the Austin American-Statesman and others have tried to get smaller station-specific apprehension data, to no avail. (The Rio Grande City station alone contains 1,228 miles of heavily crossed Starr County, including 68 miles along the Rio Grande). Border Patrol spokesman Carlos Diaz says releasing more granular detail could jeopardize “operational security” by letting cartels and other savvy adversaries know where to focus smuggling efforts. – Jay Root, Texas Tribune. This story originally appeared here. This entry was posted in KRTS News and tagged Border Issues, Border Patrol, Border Security, Border Security Spending, Immigration, Texas Border Surge. Bookmark the permalink.